Homelessness In The U.S. Was Down Slightly Over The Past Year : The Two-Way Homelessness fell overall, despite large increases in cities such as Los Angeles and Seattle, according to a new HUD report. There were declines among veterans, families and the chronically homeless. 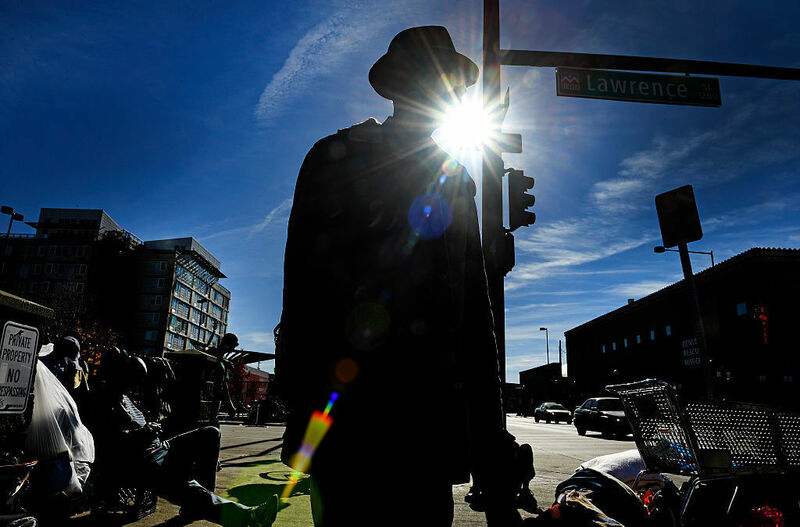 People in Denver line the sidewalks near the Denver Rescue Mission in October. Overall, almost 550,000 individuals were homeless on a single night earlier this year, according to a new report by the Department of Housing and Urban Development. (This report will be available online after 10:30 a.m. ET) That's a 3 percent decline from 2015, and continues a downward trend in homelessness over the past few years. The numbers are based on a count conducted in January by communities across the country. There were also declines in almost every homeless category, including veterans, families and the chronically homeless. But some areas bucked the trend. Washington, D.C., saw a 14.4 percent increase in homelessness, over 1,000 more people, and there were an additional 2,680 homeless people in Los Angeles County, an increase of 6.5 percent. The Dallas and Seattle areas also had big increases, 21.3 and 6.0 percent, respectively. All these cities have seen housing costs soar in recent years. "There's no doubt that the lack of affordable housing is the big driver in our homeless numbers," says Norm Suchar, who directs HUD's homeless assistance programs. Still, he notes that there was a 2.4 percent decline in New York City's homeless population this year, despite a housing crunch. He says that was due in part to a massive push there to address veterans' homelessness. Suchar notes another "less bright spot" in the numbers — a 2 percent increase in unsheltered individuals, those actually living outside. That population has been declining in recent years, but Suchar says several cities on the West Coast, especially LA, saw big increases. About one in three homeless people lives outside. The rest are in shelters or transitional housing. But overall, HUD and communities around the country are happy with the progress that's been made in recent years. They credit a broad, bipartisan effort to reduce homelessness. Homeless veterans especially have benefited in recent years from an investment of billions of dollars in federal funds to move them into permanent supportive housing, and veterans' homelessness dropped 17 percent this past year. Still, there were more than 39,000 homeless vets in January, despite an Obama administration vow to eliminate veterans' homelessness by the end of last year. There were also more than 194,000 people in homeless families in January, a 6 percent drop from the year before. The number of homeless unaccompanied youth also appeared to drop — to 35,686 — although HUD says it's not clear how accurate those numbers are for this difficult-to-count group. "We have a pretty good understanding of what the solutions to homelessness are," says Suchar, adding that money invested in moving people into permanent housing has had a huge impact. Still, some advocates complain that the department has drained funding from transitional housing, which some feel can help homeless individuals get back on their feet by providing temporary support. The numbers also don't reflect the growing number of families in the U.S. who pay more than half of their incomes on rent or who are doubled up with family and friends. Both of these are seen as signs that someone could become homeless soon.